Founded in 1967 by Bob Cacchione, the IHSA was the first to make equestrian sports part of the college experience for male and female students in a manner that is fun, affordable, educational and competitive. Numerous Olympic riders, including Greg Best and Beezie Madden are alumni of IHSA. Each year over 8,000 IHSA riders of all skill levels from over 360 colleges compete individually and as teams at regional, zone, and national championship levels. There are no recruiting guidelines in the IHSA regarding amateur status. You can be a professional, earn prize money at horse shows, give lessons, sell horses for profit and still ride on an IHSA team. The IHSA coaches and prospective riders have no limits placed on them with regards to contacting each other and prospective riders can visit schools without restriction. Prospective athletes that are hoping for a scholarship need to realize that good grades and good SAT/ACT scores are just as important as your riding ability. 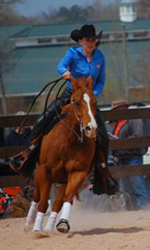 The American National Riding Commission, Inc. (ANRC) was established in 2006. The purpose is to initiate a standardized method to educate riders in hunt seat equitation and to create a "Rider Certification" system to assess riding ability and knowledge of riding theory. ANRC continues to support these goals with competitions, clinics, and distribution of educational materials. States in the thirties and established a riding school. His progressive riding system has influenced many professional riders and trainers, including Jane Dillon, George Morris, Joe Fargis, Lendon Gray, Pam Baker and Bernie Traurig. competitions; consists of a written phase, a program ride using USEF Tests 1-19, 3' hunter trials equitation on an outside course and a 3' hunter seat equitation course in the ring. In 1998, equestrian was classified as an NCAA emerging sport. Many people within the horse industry have united together to help advance the sport to full NCAA championship status. In order to attain this goal and hold a NCAA Equestrian Championship, there must be 40 Division I/II schools that sponsor equestrian as a varsity level program. Currently 23 colleges and universities offer equestrian as a varsity sport and more continue to add the program each year. New! Click Here For Advice On Making Your College Video. Information Straight From An NCAA Team!